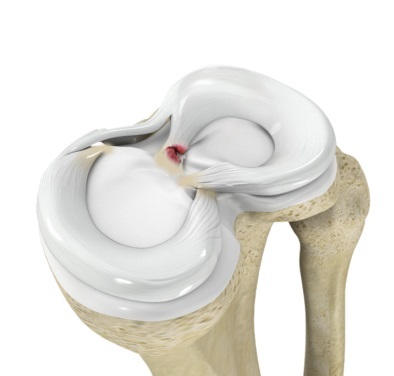 Meniscal root tears are devastating tears of the meniscal cartilage in the knee at the point where it connects to bone. In essence, the root is the anchor point of the meniscus. Such tears can lead to significant knee pain, dysfunction, instability and rapid development of osteoarthritis. The condition has been referred to as a “silent epidemic” - coming to light only in the last decade or so. This is probably because despite their serious nature, meniscal root tears are difficult to recognize and treat appropriately. Meniscus root tears have not always been obvious on an MRI or arthroscopy; however, knee specialists will look for these injuries as they can be problematic if missed. The meniscus is a wedge-shaped cartilage present between the tibia (shinbone) and femur (thighbone) in the knee joint. There are two menisci per knee – one on the inside called the medial meniscus and one on the outside called the lateral meniscus. The role of the meniscus is to distribute the vertical load over a larger surface area, to help with shock absorption, to provide secondary rotational stability, and to protect the articular cartilage which lubricates the ends of the shinbone and thighbone, so they side smoothly over each during walking or running. Clearly, the meniscus plays a major role in maintaining normal knee kinematics and biomechanics! Depending on how they occur, meniscal root tears can be divided as traumatic or degenerative. Traumatic meniscal root tears generally occur in the younger, athletic population and are typically more commonly located in the lateral meniscus in conjunction with an ACL tear. They may be caused by a sudden twisting motion when planting the foot. The options for treatment of meniscus root tears are either nonoperative management with physical therapy and/or injections or operative management. Operative management involves either surgically trimming the root of the meniscus or surgical repair by stitching the root of the meniscus and reestablishing the connection with the bone. Trimming of the meniscus root is not the same as “fixing or repairing” the meniscus and should be clarified in any discussion. Repairing or suturing the meniscus root will require a period of 4-6 weeks of crutch use as well as physical therapy. This is in order to protect the repair the surgeon has performed. Surgery is arthroscopic in either situation, but suturing is technically much more challenging and not all surgeons are familiar with this procedure. As much as possible, Dr. Patel recommends surgical suturing to preserve knee structures and prevent or limit osteoarthritic changes further down the road. In fact, multiple studies have shown that simply “trimming” the meniscus root tear will lead to a 30-40% chance of needing a total knee replacement within 5 years. Ideal candidates for meniscal root repair would be non-obese individuals with either acute or chronic meniscal tears without any signs of arthritic changes or joint space narrowing. If you or someone you love has been diagnosed with a meniscal root tear, the good news is for the right candidate, surgical techniques and instrumentation are available today that make meniscal root repair a viable option to regain knee strength and mobility.